Devil May Cry 5 may be announced at this year’s E3. A domain name for a fifth installment in Capcom’s hellish hack-and-slash game has been discovered ahead of the conference, which begins next week (although conferences begin this Saturday). The domain name – devilmaycry5.com – doesn’t mean much by itself, as anyone could register a domain with that title. What lends the information a little extra credence is the name of the registrar – ‘Onamae’. Onamae is an internet provider based in Japan, a company that Capcom worked with to register domains for Monster Hunter: World and Resident Evil 7 shortly ahead of their official releases. We’re just days away from E3, so now is a good time to get up to date with upcoming PC games. The domain servers were first registered on Friday night, June 1 – just ten days before E3 is due to begin. 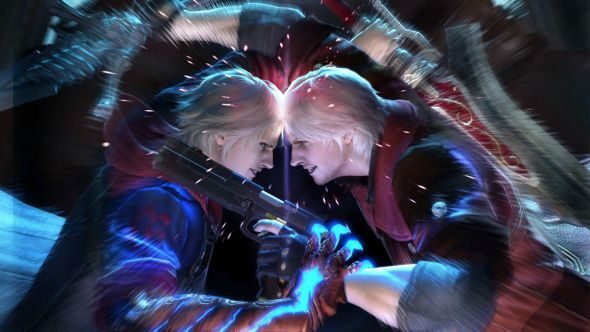 That suggests we’re close to a brand new announcement, and there’s been more than enough time for Capcom to make a new game in the series – Devil May Cry 4 released in 2008, meaning its been ten years since the series’s last numbered outing. Obviously, there are next to no details about the new game, and you’ll have to wait a little while to learn whether or not this is even a real project, let alone what it actually includes. We’ll update this story when we know more.